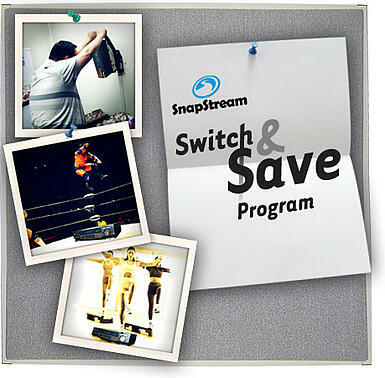 We often get the question, "How does SnapStream's TV search appliance work?" so here's a brief explanation. A presidential campaign wants to search for every mention of their candidate and their candidate's competition is mentioned on TV -- so they can respond to that TV coverage more efficiently. A city government wants to search all of their local TV stations for mentions of their police department, their fire department, and anything else related to their city government. A television comedy show (like The Soup on E!) wants to search thousands of hours of television for things to make fun of. A journalism department at a university wants to do a type of research called content analysis (also known as textual analysis), so they use our search technology to chart word frequencies over time. and finally there's an excerpt of the transcript with the matching words bold-faced. (A side note: you can also setup SnapStream Alerts that would e-mail you everytime certain words appeared on television -- the results would look similar, but you'd get them on e-mail). The FCC requires closed-captioning to be included on almost all TV programming (more on the details of this on the fcc.gov website). So while SnapStream Enterprise is making a recording, it also simultaneously records all of the closed-captioning data for that show. 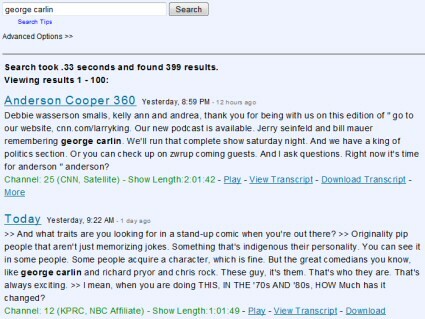 In the process of recording the closed-captioning, SnapStream Enterprise does some clean-up of the text to make it easier to read and easier to search. And then we index all of that text in a time-coded fashion, so when we find a match, we can direct the user to not only the program where the match occurred, but also to the time within that program. Program guide data is also used in our search process so users can easily filter searches by program genre, by channel, or by program title. In addition to being simple to use, the SnapStream TV search engine also offers up a lot of power in the hopes that our customers can find whatever it is they are looking for on television. More on this in the next blog posting! Meanwhile, if you have any questions, post 'em in the comments.